The hairy fungus beetles (Coleoptera: Mycetophagidae) in Almaty oblast of Kazakhstan is reviewed including diagnoses, illustrations, distributions, and natural history. Total 7 species and 3 genera were identified - Mycetophagus quadripustulatus, M. quadriguttatus, M. fulvicollis, M. multipunctatus, M. piceus, Litargus connexus and Typhaea stercorea. The data on the fauna of hairy fungus beetles of 3 protected areas of Almaty oblast are given. In the State national natural park "Ile-Alatau" all 3 genera and 7 species of Mycetophagidae found in Almaty oblast are noted. 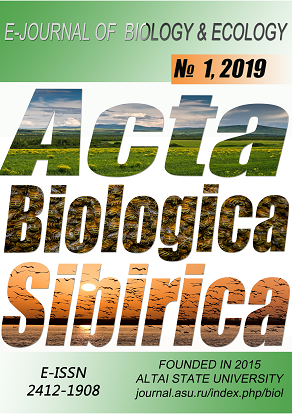 For the State national natural park Altyn-Emel, 3 genera and 5 species are indicated: M. quadripustulatus, M. quadriguttatus, M. piceus, Litargus connexus and T. stercorea. In the State national natural park "Zhongar-Alatau" 2 genera and 4 species were found: M. quadripustulatus, M. quadriguttatus, M. multipunctatus and T. stercorea. At present, the State national natural park “Ile-Alatau” is the richest in species diversity of hairy fungus beetles from the three specially protected natural territories in which research was conducted. Information about some species of fungi, on which hairy fungus beetles were marked, is presented for the first time. M. quadriguttatus has not previously been reported on Agaricus campestris, Russula betularum, Pleurotus dryinus, P. ostreatus, Сoprinellus domesticus, Lepista personata. M. quadripustulatus - not recorded on the fungi Bjerkandera fumosa, L. personata, Cortinarius purpurascens, P. dryinus and Agaricus bitorquis. M. piceus - on B. fumosa, C. purpurascens and P. dryinus. M. multipunctatus - on Trametes ochracea, L. personata, C. purpurascens, A. bitorquis, R. betularum, Lycoperdon pratense and P. dryinus. M. fulvicollis on T. ochracea, Cerioporus squamosus, Scleroderma citrinum and P. ostreatus. Litargus connexus - on L. personata, C. purpurascens, T. ochracea and P. ostreatus. T. stercorea - on Antrodia serialis, C. purpurascens, T. ochracea, C. squamosus and Byssonectria terrestris. Arnoldi, L. V., & Kryzhanovsky, O. L. (1965). The family Mycetophagidae – Hairy fungus beetles. In: Key of insects in the European part of the USSR. T. II. Beetles and twisted-wing insects. M.L. : Science, 327-329. (In Russian). Baizakov, S., Iskakov, S., Mukanov, B., Toktasynov, Zh., Sarsekova, D., & Zhorabekova, Zh. (2010). Handbook of forester Kazakhstan. (In Russian). Benkovskaya, M. Ja. (2017). Alien beetles of the European part of Russia. Abstract of dissertation for the degree of Doctor of Biological Sciences. Moscow, 401. (In Russian). Chernyshev, P. K. (1969). Pest control system during storage. Alma-Ata: Kaynar (In Russian). Fasulati, K. K. (1971). Field study of terrestrial invertebrates. Moscow. Vysshaya Shkola (In Russian). Kataev, O. A., & Popovichev, B. G. (2001). Forest pest survey to study stem insects in coniferous stands. St. Petersburg: SPbLTA, (In Russian). Kazenas, V. L., Temreshev, I. I., Esenbekova, P. A., & Childebaev, M. K. (2015). Entomofauna of the State National Natural Park "Ile-Alatau" and adjacent territories (a brief ecological and taxonomic review of published data). Proceed. of the Ile-Alatau State National Natural Park. Issue 1. Comp. A.A. Ivaschenko, R.M. Turekhanova. Astana: Zhasyl Orda, 229-288. (In Russian). Khalidov, A. B. (1984). Insects - fungus destroyers. Kazan: Kazan University Press. (In Russian). Kosolapova, G. Ya. (1976). Pests of grain stocks. Alma-Ata: Kaynar. (In Russian). Krasutsky, B. V. (1996). Mycetophilic beetles of the Urals and Trans-Urals. Vol. 1. Brief illustrated guide to determining the most common coleoptera in the entomocomplexes of wood-destroying basidiomycetes. Ekaterinburg: Ekaterinburg Publishing House. (In Russian). Krasutsky, B. V. (2005). Mycetophilic beetles of the Urals and Trans-Urals. Vol. 2. System "Mushrooms-insects." Chelyabinsk. (In Russian). Krasutsky, B. V. (2007). Brief key of mushroom beetles. Teaching manual. Chelyabinsk: Chelyabinsk State Pedagogical University Press (In Russian). Meldebekov, A. M., Kazenas, V. L., Bayzhanov, M. Kh., et al. (2011). Materials to the Cadastre of fauna of Almaty region. Part 1 - Insects. Almaty. (In Russian). Mordkovich, Ya. B., & Sokolov, E .A. (1999). Key of quarantine and other dangerous pests of raw materials, storage products and seed. VNII plant quarantine. Moscow: Kolos. (In Russian). Mushroom classification. (n.d.). In: Mushrooms of Kazakhstan. Retrieved October 27, 2018, from http://fungi.su//infusions/advanced_articles_sort/fungi_cl.php (In Russian). Nikitsky, N. B. (1991). Family Mycetophagidae - Hairy fungus beetles. In: Key to insects of the Far East. T. III. Part 2. Coleoptera, or beetles. SPb. : Science, 406-423. (In Russian). Nikitsky, N. B. (1993). Mushroom beetles (Coleoptera, Mycetophagidae) of the fauna of Russia and contiguous land. Moscow: Izdatel'stvo Moskovskogo Universiteta. (In Russian). Nikitsky, N. B. (2008) Mycetophagidae. In: Löbl, i., & Smetana, A. [eds. ], Catalogue of Palaearctic Coleoptera, Vol. 5: Tenebrionoidea. Stenstrup: Apollo Books, 51-55. Samgina, D. I. (1981). Flora of spore plants of Kazakhstan. V. 13. Gilled mushrooms. 1. Agaricales. Alma-Ata: Science of the Kazakh SSR. (In Russian). Samgina, D. I. (1985). Flora of spore plants of Kazakhstan. V. 13. Book 2. Gilled mushrooms (Agaricales). Alma-Ata: Science of the Kazakh SSR. (In Russian). Temreshev, I. I. (2017). Pests of storage and raw materials, distributed in the territory of the Republic of Kazakhstan, and some accompanying and quarantine species (species composition and brief technology protection measures). Second edition, revised and supplemented. Almaty: LLP "Nur-Print". (In Russian). Temreshev, I. I., Childebaev, M. K., & Esenbekova, P. E. (2015). Insects, collected in window traps in the State National Natural Park "Ile-Alatau" in 2014. KazNu Bulletin. Biological Series, 1 (63), 271-278. (In Russian). Temreshev, I. I., Kascheev, V. A., & Ormanova, G. (2014). Cheklist of beetles (Insecta, Coleoptera), collected in 2011 year in the light of State National Park "Altyn-Emel" and adjacent territories. KazNu Bulletin. Ecological Series, 1/1 (40), 418-423. (In Russian). Temreshev, I. I., Sayakova, Z. Z., Eszhanov, A. B., & Meka-Mechenko, V. G. (2016). To the species composition of beetles (Insecta, Coleoptera) - components of the healthy microbiocenosis of the great gerbil Rhombomys opimus (Lichtenstein, 1823) in southeast Kazakhstan. Proceed. of the International Scientific Conference "Problems of studying and preserving biodiversity of biological resources and sustainable use" December 8, 2016, dedicated to the 70th anniversary of the doctor of biological sciences, professor S.T. Nurtazin. Almaty: “Kazak universities”, 232-238. (In Russian). Vorontsov, A. I. (1982). Forest Entomology. Moscow: Vysshaya Shkola (In Russian).